Livable4All - No Grants For You! Background & Update: In 2007, Livable Income For Everyone (LIFE) could no longer keep up with administrative and financial obligations of being a non-profit society. All our members/founders were low-income and we had no funding due to charity regulations (see below). Nor could we continue to organize workshops and meetings on the topic of guaranteed livable income (aka Basic Income or Guaranteed Annual Income). The website was created and has been maintained through the unpaid work of one person (using a very old version of Dreamweaver). The same person writes for, curates, and does outreach through twitter and tumblr. There are no ads; there is no funding. If you like this website and would like to donate find out more here. 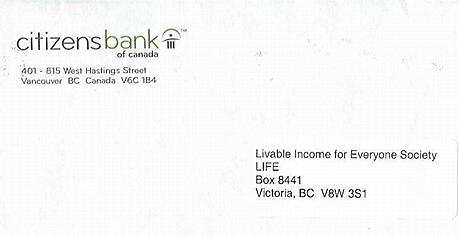 In June 2006 LIFE received a letter from the Citizen's Bank of Canada ( a Vancity company). It said: "Congratulations, your organization has been nominated to apply for a grant from Citizen's Bank of Canada, through the Shared Interest Program. In 2005, $225,650 was distributed to 12 registered charities through this program... Only groups that are nominated [by Citizen's Bank members] will receive this invitation to apply." We would like to very much thank whoever nominated us to recieve these funds (which could have been around $15,000). Unfortunately, we cannot qualify to apply for the funds because we are not a registered charity. We emailed Citizen's Bank to enquire if another group with a charity number could adminster the funds for us, but we were told that this would not be possible. LIFE is a registered non-profit society but is not a federally registered charity and we likely will have difficulty in becoming a registered charity due to Revenue Canada "political activity" rules. These rules allow you to alleviate poverty all you want but not to advocate for systemic change to end poverty. Ending poverty is not a charitable activity. Advocating policies that kill poor people apparently are, as all right wing think tanks are registered charities. For example, The Fraser Institute, which asked the question "Should a single female parent with three children have a right to expect economic support from the state?" (Lexicon of Economic Thought, Walter E. Block, Michael A. Walker, The Fraser Institute, 1988) is a registered charity. And in March 2004, Jason Clemens, who works for the Fraser Institute stated in an interview with Adrienne Mercer for a 2004 Monday Magazine (March 25) cover article on guaranteed income that "[A Guaranteed Annual Income] would wipe out savings and increase our tax burden... labour force participation would decrease, because people would have less incentive to work. 'In many cases, you would be hurting the very people you're trying to help." And then there was Fraser Institute director Fred McMahon writing an article in the Vancouver Sun titled "Poverty is voluntary, so let's end it" in August 9, 2001 where he recommends "End welfare. Reinstitute poor houses and homes for unwed mothers... All the barriers people once faced--barriers that could pen people into poverty--have disappeared... The safety net makes the consequences of bad choices seem more tolerable. Anti-poverty programs all too often make poverty more acceptable and thereby perpetuate it... In today's society of great opportunity poverty is usually a voluntary choice." Interestingly, Christopher Sarlo's 2001 article on poverty on the Fraser Institute website states: "A more efficient alternative might be a guaranteed annual income issued as a universal demogrant--a transfer payment to all citizens (or residents) with no conditions on employment, earning, or income. " We will continue to seek donations to help support the work which we are doing. We rely on 100% volunteer labour and have no office. The few funds that are donated, go towards our communications expenses, digital and paper, and to pay for costs associated with our presentations and workshops. We very much appreciate all memberships and donations. We would also like to acknowlege the donation from the Public Service Alliance of Canada as part of their efforts in the Make Poverty History campaign).